Darwin (130.846E 12.461S), with its roomy harbor and modest port facilities (including two berths for oceangoing vessels), was the site of a small but strategically located naval base in late 1941. The principal settlement in northwest Australia, its rail link to the more populous regions of the continent was not completed until decades after the war; the only land link was a highway to the railhead at Alice Springs deep in the continental interior. Its vast hinterland is very sparsely settled and produces only a small quantity of agricultural items. The site was first settled by Europeans in 1839. Kehn (2008) describes the wartime port as "a red-dirt hellhole. 'It had a small naval station, post office, a few little shacks, a small outdoor theatre, and two bars. A large slaughterhouse for sheep and some beef were the cause of great amounts of blacks flies.' With drinking water and decent food scarce, beer became the second-most precious liquid commodity in the region." Darwin experiences a distinct monsoon season, with a very dry winter and heavy rains in the summer, but little temperature variation. At the time war broke out, 23 Brigade was at Darwin preparing to send its battalions to Kupang ("Sparrow Force"), Amboina ("Gull Force"), and Rabaul ("Lark Force"). Darwin was also headquarters of 7 Military District, with about two battalions of militia. Warships in the harbor included an auxiliary cruiser, five coastal minesweepers, and three net tenders. Darwin Field based 2 Squadron equipped with 8 Hudsons. The Darwin Raid. With the loss of the airfield at Victoria Point, Allied aircraft replacements could reach Southeast Asia only by ship or by an air bridge in which Darwin was a vital link. The Japanese therefore acted to deny the Allies the use of Darwin by launching a massive carrier raid against the port on 19 February 1942. Some 190 aicraft from four of Nagumo's carriers and another 54 land-based bombers based in the Netherlands East Indies participated. 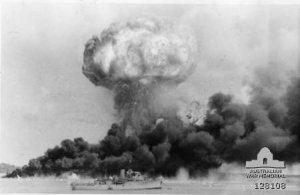 The harbor was smashed, eight ships sunk and another thirteen damaged, and two dozen Allied aircraft destroyed, rendering the harbor useless as a rear base for the defense of Java. Total Allied casualties exceeded 250 dead. However, the town remained in Allied hands, and a large airfield complex was built up around it from which the Allies could conduct strategic bombing of the eastern Netherlands East Indies and western New Guinea.